Middle-aged surgeon face operating a patient. Blurred windows with jalousie background. Middle aged doctor in lab coat with arms folded. Confident physician in protective mask. Blurred windows with jalousie background. 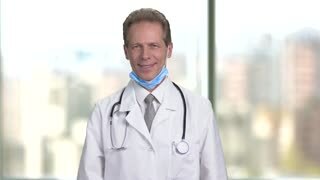 Mature middle aged smiling doctor folding arms. Bright abstract blurred windows background with view on city. Mature woman in suit laughing hard out loud. Middle aged blind lady against blurred windows background. Meditating mature woman in office. Portrait of middle aged businesswoman in bright blurred windows background. Cool serious black businessman. Middle aged afro american man in suit touching his lip, white isolated background.